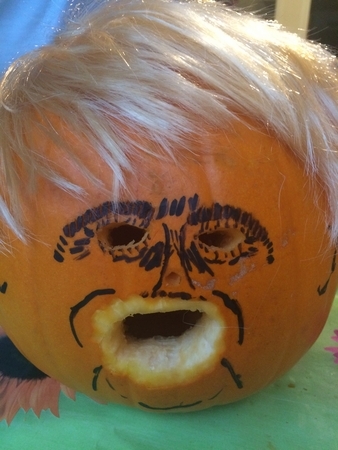 While the other Trumpkin might be a more accurate representation of what our president physically looks like, this Trumpkin is accurate in a different way. We've had plenty of submissions over the years of pumpkins that depict what a celebrity looks like, but I think this is the first time we've gotten a visual representation of how everyone feels about them. That hole he has for a mouth looks like it's just about the right size for a fist. I don't think that's a coincidence.